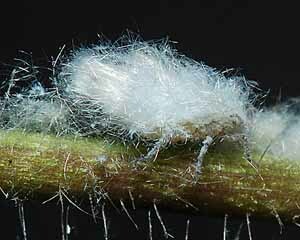 Thecabius are small to medium-sized aphids (the alate body length is usually 2 - 3 mm) which have short antennae and siphuncular pores. Dorsal wax gland plates are present on all segments, producing a dense covering of wax spicules. There are about 17 Thecabius species, most of which host alternate and have a sexual stage in the life cycle. The primary host is poplar (Populus: Salicaceae) where the fundatrix induces a gall on the leaves, petioles or branches. The secondary host is the roots or stems of plants such as buttercups (Ranunculus: Ranunculaceae), Lysimachia (Myrsinaceae) and sallow (Salix). Thecabius are not attended by ants. The Thecabius affinis fundatrix is green or bluish green, covered in wax and lacks siphunculi, and inhabits a small gall of its own on poplar in spring formed by folding the edge of a leaf. 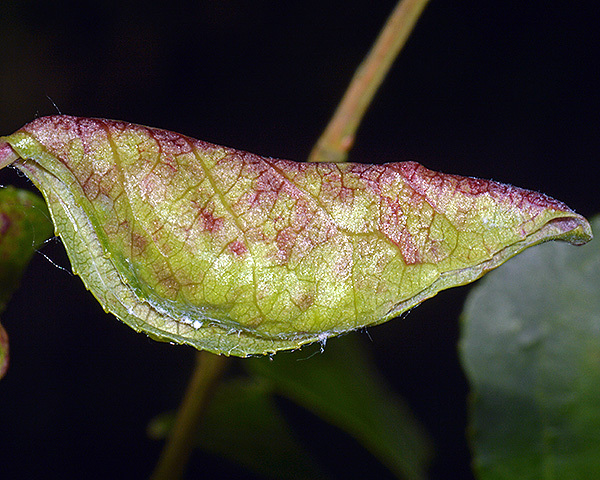 The offspring of the fundatrix leave this gall and move to the midrib of a young leaf where they induce the lamina of the leaf to fold along the midrib towards the underside. The roof-like gall develops blisters and gradually turns reddish (see first picture below). 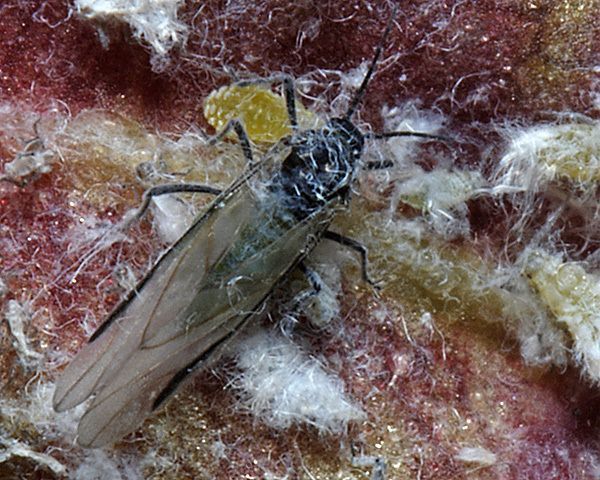 The winged viviparous female of Thecabius affinis (see second picture below) that develops from the offspring of the fundatrix is greenish, covered with wax spicules and has siphuncular pores. The antennae are short, about half the body length. The terminal process is 0.25 times the length of the base of the last antennal segment. The body length of winged Thecabius affinis females is 2.2-3.1 mm. The viviparous alates migrate to their secondary host - the stem bases and on the runners of buttercups (Ranunculus) - where their offspring develop to adult apterae (see third picture above) which are densely covered in wax spicules. Thecabius affinis usually host alternates from its primary host of poplar (Populus) species to buttercup (Ranunculus spp. ), although some populations remain all year on buttercup roots. On poplar the fundatrix inhabits a small gall of its own on poplar (Populus), but its offspring leave this gall and stimulate development of a larger gall where the outer, upper side of the leaf becomes blistered and reddish. The winged viviparous females that develop in the gall on poplar leave in late June-July to found waxy colonies at the stem bases and on the runners of buttercups. Alatae migrate back to the primary host in autumn. Dixon, A.F.G. & Thieme, T. (2007). Aphids on deciduous trees. Naturalist's Handbooks 29. Richmond.